Driver safety is related to driver training, driver impairment, individual characteristics of the driver and cultural differences. So, it's a multifaceted theme that covers different aspects. In this blog I want to present short articles on these aspects and the significance of car driving simulators, and I hope you enjoy reading them. The following article is an unpublished experiment from my thesis, from adaptive control to adaptive driver behaviour. It was performed in a research car driving simulator. For references the reader is referred to this thesis. In a driving simulator experiment the relation between preferred time-headway in steady-state car-following and operational competence in braking reactions was studied. The hypothe­sis that drivers with smaller preferred time-headways are able to react faster or generate a faster motor response per se was not confirmed. Also, no evidence was found for differences in perceptual processes related to the detection of braking by the lead vehicle be­tween short followers and drivers with a larger preferred time-headway. The results suggest that short followers generate a faster motor response when there is some uncertainty con­cerning the level and duration of decele­ration of the lead vehicle in case it brakes. The results suggest that short followers differ from long followers in the ability to transform visual feedback to a required motor response. However, the presence of brake lights is required for the relation between operational performance and choice of time-headway to hold, possibly because a change in feedback requirements, i.e. the absence of brake lights, is more detrimental for skilled performers. Choice of time-headway (THW) in car-following has been associated with task-related factors and with factors related to temporary state in a number of studies. The results of these studies may be explained in terms of an adaptati­on of choice of THW to perceived per­formance decrements in operati­onal skills related to braking. The impor­tance of task-related factors appears from the studies of Fuller (1981) and Brook­huis et al. (1991). Fuller (1981) stu­died THW of truck drivers. During the late shift, consis­ting mainly of driving in the dark, time-headway was signi­ficantly larger than during day time dri­ving. Fuller explai­ned this as an effect of visual conditi­ons. Brookhuis et al. (1991) reported an increase in THW when using a car telep­hone while dri­ving. The effects on THW may be explained as a result of awareness of the effects of task demands on the ability to detect a dece­lera­tion of a lead vehicle resulting in an adaptation of THW to compensate for this. A number of other studies have shown that choice of time-headway is sensitive to temporary states. Fuller (1984) reported a time-on-task effect on THW for older truck drivers in the late shift. After seven hours of driving, THW increa­sed quite strongly, accompa­nied by verbal reports of performance decre­ments, drowsi­ness and exhausti­on. In an expe­riment reported by Smiley et al. (1981) in an inter­active dri­ving simula­tor, mariju­ana resulted in increased headway during car-follo­wing. Smiley et al. (1986) again found that marijuana significant­ly increased headway in a car-follo­wing task. Smiley et al. (1985) reported that marijuana increa­sed headway while alcohol decrea­sed headway. These results strongly sug­gest effects of temporary states such as fatigue or states induced by marijua­na and alcohol on preferred THW; fatig­ue and marijuana increase preferred THW, which may be a reflecti­on of an adaptati­on of THW to perceived adverse effects on the braking response, whereas alcohol decreases preferred THW, possi­bly because drivers overestimate their braking compe­ten­ce under alcohol. The effects of task-related factors and trans­ient states refer to intra-individual diffe­rences. The re­sults suggest a process of adaptati­on of THW to changes in operati­onal competen­ce which is influ­enced by task-related and state-related fac­tors. From the same perspec­tive, inter-indi­vi­dual differences in following behaviour, may be related to inter-individual diffe­rences in operational level competence, such that preferred THW is adapted to limitati­ons in braking-related competence. These limita­tions in braking competence may be determined by specific skills required for opti­mal braking performance. In that case drivers may adapt time-headway to their braking skills such that the time available to reach the same level of deceleration as the lead vehicle in case it brakes mat­ches the time needed by the driver to reach this level of deceleration. The former is equivalent to the momentary time-head­way. The latter may be related to braking related skills of the driver. Extrapolated to the more general case, behaviour on the tactical level is assumed to be adapted to opera­tional skills. The same reaso­ning was applied to speed choice in curves by Van Winsum and Godthelp (1996). They found a strong relation between choice of speed in curves and steering per­formance on straight roads, such that drivers adapt the speed in curves to their steering competence. An important research question then focuses on finding the relevant skills that discriminate drivers with different preferred time-headways. In the normal case of braking for a decelerating lead vehicle, the driver adjusts the timing and intensity of the bra­king response to the criticality at the moment of detection of a deceleration of the lead vehicle and the deve­lopment of criticality in time. In this, TTC informati­on is assumed to plays an important role (e.g. Van der Horst, 1990; Cavallo et al., 1986; Cavallo and Laurent, 1988; Lee, 1976), although it is not clear how TTC information affects the braking response. However, when the driver is instructed to brake as fast as possible as soon as a deceleration of the lead vehicle is detected, the timing and intensity of braking are expected to depend on the limits of per­ceptual and motor skills instead of TTC information. The dominant view in studies of braking has been that perceptual limitations, instead of response mecha­nisms, are responsible for rear-end collisions. In the literature braking skill is generally studied as the ability to brake as fast as possible instead of the ability to tune the timing and inten­sity of braking to the dynamic requirements of the situa­ti­on. This is somewhat surprising given the ecological desirabili­ty to brake with a velocity and intensity that matches the requi­re­ments of the situation. In the literature, brake reaction time (BRT), or alternatively, perception-response time is used as an index for braking per­formance. This is defined as the interval between the onset of the stimulus, usually the brake lights of the lead vehicle, and the moment the foot touches the brake. BRT differs from reaction time (RT) as it is nor­mally applied in experi­mental psychology. 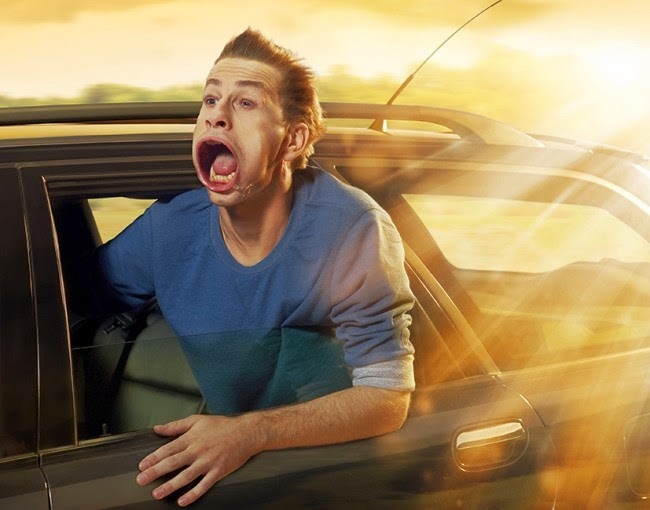 RT for a dece­lera­ting lead vehicle is measured as the interval between the moment the lead vehicle starts to decele­rate and the moment the foot is retracted from the accelerator pedal. Although BRT includes reaction time, it covers the time to move the foot from the accelerator to the brake pedal as well. A reduction of BRT has been proposed as a means to reduce the number of rear-end colli­sions. Experi­ments that were aimed at finding factors that decrea­se BRT have been carried out for years (see for example McKnight and Shinar, 1992). For this purpose, center high-mounted stop lamps (CHM­SL) have become standard equipment in passenger cars in the United States, although the evidence for actual reduc­tions in BRT by these lamps is limited (McKnight and Shinar, 1992, Sivak et al., 1981). There is however some evidence that CHMSL reduces the number of rear-end accidents (see for instance Rausch et al., 1982). Thus, the scientific answer to the assu­med perceptu­al limitations in braking has been to decrease the detection time by technical means. Other factors have been found that affect BRT as well. Johans­son and Rumar (1971) found that BRT to anticipated events is faster than for unex­pected events. Olson and Sivak (1986) reported an average BRT to expected stimuli of about 0.7 s. while it was about 1.1 s. to unexpec­ted stimu­li. The expectancy effect was also reported by Sivak (1987). The nature of the stimulus affects BRT as well. In car-following situations BRT is faster compa­red to other situati­ons such as the detection of a stati­onary police car (Sivak, 1987). Fur­thermore, distance headway has a substantial effect on BRT (see for instance Brookhuis and De Waard, 1994, McKni­ght and Shinar, 1992 and Sivak et al., 1981). From an adaptation perspective, perceptual skills related to the detection of a deceleration of the lead vehicle may be a determining factor for choice of time-headway. In that case a relation is expected between preferred THW and reac­tion time. The reaction time interval consists of a series of information-processing stages. The additive factor method, introduced by Sternberg (1969), assumes that these processing stages are serial and that the duration of these stages are independent. It is a method for studying the locus of effect of differences in RT. Several task variables are known to affect RT via effects on specific information-processing sta­ges. According to the additive factor method, if two task variables interact in their effect on RT a common processing stage is involved. Additive effects of two task variables on RT are indicative of separate effects on different processing sta­ges. In this chapter, the additive factors method is used to determine whether differences in RT as a function of preferred THW are caused by differences in the input side or the output side of the information-processing chain. Figure 1 shows the successive information-processing stages that are assumed to determine RT. Stimulus degradation is known to affect the stimulus enco­ding stage on the input or percep­tion side of information-processing (San­ders, 1990, Frowein, 1981). In braking for a decele­rating lead vehicle, the absence of brake lights (BL) may be regar­ded as a severe form of stimulus degradation. Alter­natively, differences in RT may have a locus of effect on the output or response preparation side of the information-processing chain. Time uncertainty, manipulated by means of presentation of a warning signal (WS) in advance of stimulus presentati­on is known to affect the output or motor side of the information-processing chain. San­ders (198­0a) and Frowein (1981) reported additive effects of time uncert­ainty and stimulus degrada­tion. This indica­tes that diffe­rent information-processing stages are affected by signal quality and time uncertainty. San­ders (1980b) repor­ted an interac­tion between time uncertainty and instruc­ted muscle tension on RT. This sugge­st that the factor WS affects the motor-adjust­ment stage. Also, Spijkers (1989) reported an interac­tion between time uncertainty and response specificity sugge­sting an effect of time uncertainty, or WS, on motor adjustment. 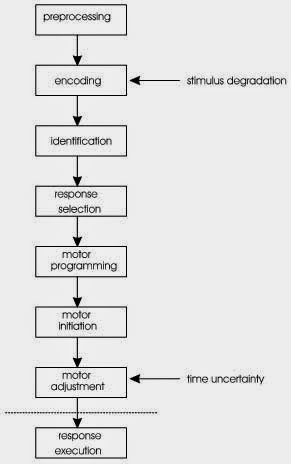 Motor adjustment represents the stage where the state of motor readiness is modulated by straining the muscles. The additive factor method has not only been applied to the study of information-processing stages, it has also been used to study individual differences related to, for example, dementia (Jolles, 1985) and hyperactivity in children (Spijkers and Curfs, 1986). This is important since the present study uses the additive factor method to explore information-processing factors underlying individual differences in behaviour. In summary, if short followers differ in RT from drivers who follow with a larger THW, the reasons for differences in RT may be located on the input and/or output side of the information-processing chain. It can then be tested whether short followers differ from drivers with a larger preferred THW in the stimulus encoding stage with the BL manipula­tion. If drivers with a larger preferred THW are less efficient or slower in stimulus encoding, stimulus degradation is predicted to result in a relative­ly larger effect on RT for these drivers. Thus, differences in stimulus encoding as a function of preferred THW expresses itself as an interaction between preferred THW and the BL manipulation on RT. This would mean that differences in RT as a function of preferred THW are caused by faster detection by short followers of a deceleration of the lead vehicle. Alternatively, an interaction between preferred THW and the WS manipulation on RT such that RT of short followers is less affected by the WS manipula­tion than the RT of drivers with larger preferred THW, would suggest that short followers reach the state of required motor readiness faster. In that case, differences in RT are related to response mechanisms instead of perceptual mechanisms. Choice of time-headway may also be related to the speed at which the driver is able to move the foot. In that case choice of time-headway may be an adaptation to individual differences in motor speed­. However, the additive factor method has never been successfully applied to the motor phases of respon­se execution. This means that there is not sufficient reason to apply this method to the examination of motor execution during the braking response. Also, there are no theore­tical predictions for the effects of WS and BL on the duration of the motor phases that follow the RT interval when the subjects are required to brake as fast as possible. 1) Is preferred time-headway related to differences in reaction speed to a deceleration of the lead vehicle, and if so, are the diffe­rences located on the perceptual or the response side of the information-processing chain. 2) Is preferred time-headway related to skills involved in motor executi­on. The experiment was performed in an interactive simulator. This allows full control over the behaviour of the lead vehicle and accurate on-line measurement of time-related varia­bles. Apparatus. The experiment was performed in the driving simulator of the Traffic Research Centre (TRC). This fixed-based simulator consists of two inte­grated subsys­tems. The first subsystem is a conventional simulator composed of a car (a BMW 518) with a steering wheel, clutch, gear, accele­ra­tor, brake and indica­tors connected to a Silicon Graphics Skywriter 340VGXT compu­ter. A car model converts driver con­trol actions into a displacement in space. On a projection screen, placed in front, to the left and to the right of the subject, an image of the outside world from the perspective of the driver with a horizontal angle of 150 degrees is projected by three graphi­cal videopro­jectors, controlled by the graphics software of the simulator. Images are presented with a rate of 15 to 20 frames per second, resulting in a sug­gestion of smooth move­ment. The visual objects are buil­dings, roads, traffic signs, traffic lights and other vehicles. The sound of the engine, wind and tires is presented by means of a digital soundsampler recei­ving input from the simulator computer. The second subsystem consists of a dynamic traffic simu­la­tion with interacting artificially intelligent cars. For experimental purpo­ses different traffic situa­tions can be simulated. The simula­tor is described in more detail elsewhere (Van Wolffe­laar & Van Winsum, 1992 and Van Winsum & Van Wolf­felaar, 1993). Procedure. The experiment was preceded by another one in which the same subjects had been dri­ving in the simulator for about one hour. Instructions were delivered in wri­ting. Pre­ferred time-headway was measured as fol­lows. Subjects were in­structed to drive 80 km/h where possible and to follow the lead vehicle at the distance they would choose in real traffic. A lead vehicle in front of the simulator car controlled its speed such that a THW of 1 second was maintained. After a while the lead vehicle started to maintain a constant speed of 80 km/h and the subject was required to choose the preferred THW. As soon as the preferred THW was reached the subject pressed a button. Time-head­way, calculated as distance headway divided by the speed of the simulator car in m/s, at the moment the button was pressed was used as a measure for pre­ferred time-headway (THWpref). After this, braking performance was measured. Four trials were executed suc­cessi­vely. A trial consisted of braking with the instruction to brake as fast as possible follo­wed by braking with the instruction to brake normally. Only the results of braking responses with the instruction to brake as fast as possible are reported here. Subjects were requested to drive with a con­stant speed of 80 km/h and not to exceed the lane boundaries. Speed (in km/h) was continu­ously pro­jec­ted on the screen in front, allowing subjects to monitor the behaviour of the lead vehicle. The lead vehicle maintained a constant time-headway of 1 second. After a while, i.e. about 1 minute, it braked to a full stop with a deceleration of 6 m/s². In two trials, a warning signal (WS) was presented 1 second before the lead vehicle braked, while in the other two trials no WS was presented. A WS consisted of three stars projected on the screen during 1 second. Subjects were told a WS indica­ted that the lead vehicle might brake after 1 s. They were reque­sted not to release the right foot from the accelerator until they were sure that the lead vehicle actually braked. The lead vehicle only braked when the accele­rator position was not more than 5% less than 1 second before. This means that bra­king of the lead vehicle never occurred while the S was relea­sing the foot from the accelera­tor pedal. In two trials the lead vehicle carried brake lights during braking, while in the other two trials the brake lights were switched off. This constitu­tes the BL manipula­tion. The trials were administered in four different orders (see table 1). Subjects were randomly assigned to one of these orders with the re­striction that the same number of subjects were represen­ted in each order of trials. Reaction time (RT) was calculated as 3-2. Movement time (MT) was calculated as 5-3. MT was recoded as a mis­sing value when there was more than one brake peak in a trial. The occur­rence of more than one brake peak indicates that the subject braked, retrea­ted the foot, and pushed the brake again. This indicates that the instruction to brake as fast as possi­ble was not followed and it occurred in two sub­jects. The effects of WS and BL on RT and MT were tested with an analysis of variance repeated measure­ment design. Preferred time-headway was treated as a between-subjects factor. Subjects. 78 subjects participated in the experiment, 38 were male and 40 were female. 40 subjects were younger than 25 years of age, and 38 were older, but not older than 40. The average number of years the subjects were licensed to drive a car was 7.38 (sd. 4.87), total kilometrage was 88600 km (sd. 134355) on average, while the average annual kilometrage was 11786 (sd. 14794). Three groups (THWpref groups) of equal size were created from the distribu­tion of preferred time-headway. The group 'short' followers includes the subjects with smallest preferred time-headway, the group 'medi­um' follo­wers contains subjects in the middle range of preferred time-headway, while the group with hig­hest preferred time-headway are the 'long' follo­wers. The average time-headways of these groups can be seen in table 2. The ef­fects of THWpref groups on RT and MT are listed in table 3. Table 3. Effects of THWpref groups on RT and MT, df between brackets. Short followers did not exhibit a faster RT than dri­vers with a larger preferred time-headway. 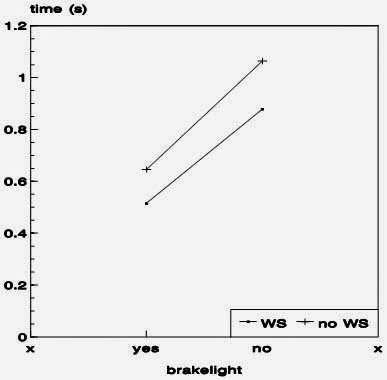 Also the duration of the movement phase of braking (MT) was not significantly affected by THWpref groups.. The effects of WS and BL on RT are shown in figure 2. There was a significant main effect of WS on RT (F(79,1)=4­5.91, p<0.001). The effect of BL on RT was statistically significant as well (F(79,1)= 290­.41, p<0.001). The inter­action was not signifi­cant (F(79,1)=2.18, p=0.144). WS and BL had additive effects on RT in the expected direction. The effects of WS and BL on MT are presented in figure 3. WS had a signifi­cant main effect on MT (F(76,1)=12.50, p<0.00­1). The effect of BL was not significant (F(76,1)=0.21, p<0.6­46). The inter­ac­tion was not signi­ficant (F(76,1)=­0.49, p<0.487). The interactions with THWpref group are listed in table 4. Table 4. Interactions of THWpref group with WS and BL. The interactions of WS and BL with THWpref groups on RT were not signifi­cant. Thus, no evidence was found for differences between short followers and drivers with a larger preferred THW in the stimulus encoding and motor-adjustment stages. The interaction between THWpref and BL on MT was significant. This interaction was analy­zed in more de­tail. 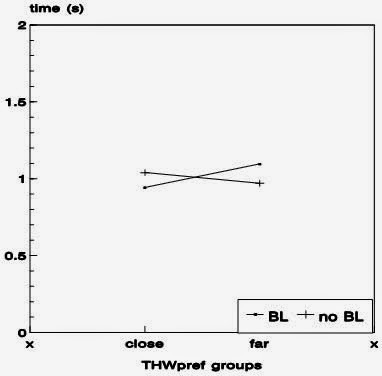 MT of the two extreme THWpref groups (short and long followers) were compa­red for the BL and non-BL trials separately. MT during BL trials was significantly faster for short follo­wers compared to long followers (F(49,1)=4.17, p<0.05). During non-BL trials MT was not significantly different for short and long followers however (F(49,1)=0.72, p=0.401), see figure 4. This means that only in trials in which the brake lights were switched on short followers moved their foot faster to the maximum level compared to long followers. 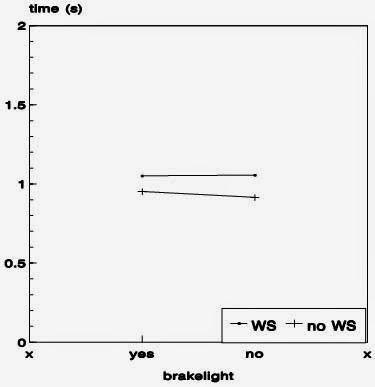 Post-hoc analyses revealed that the THWpref x BL interaction on MT was mainly caused by an effect of preferred THW on MT for the first braking trials in which the lead vehicle carried brake lights. The results of regression analyses with MT as a dependent variable and prefer­red THW as an indepen­dent variable are listed in table 5, for BL and non-BL trials separately. It can be seen that only for first trials in which the brake lights on the lead vehicle were switched on MT was a function of preferred THW, such that drivers with a smaller preferred THW moved their foot faster from the accelerator pedal to the brake maximum. Figure 2. RT as a function of WS and BL. Figure 3. MT as a function of WS and BL. and for BL and non-BL trials separately (df between brackets). Figure 4. Average MT for short and long followers, for BL and non-BL trials. It was tested whether this had caused the THWpref x BL interaction to become significant. The THWpref x BL interaction was examined for the last two trials (3 and 4) only. This interaction was not significant (F(75,2)=2.18, p=0.120), while the THWpref x BL interaction was significant for the first two trials (1 and 2) only (F(72,2)=4.52, p<0.05). The experiment was performed in an interactive driving simula­tor. Drivers were subjected to a number of scenarios in which the lead vehicle braked sharply from 80 km/h until it came to a full stop. The lead vehicle started to brake at a time-headway of 1 second. Subjects were instructed to brake as fast as possi­ble as soon as the deceleration of the lead vehicle was detected. Subjects knew in advance that the lead vehicle would brake. Presentation of a warning signal (on/off) and application of brake lights on the lead vehicle (on/off) were admi­nistered in a within-subjects de­sign, resul­ting in four bra­king conditions. The theoretical perspective of the present study was that drivers adapt time-headway to their braking skills in such a way that the time available to reach the same level of deceleration as the lead vehicle in case it brakes matches the time needed by the driver to reach this level of deceleration. Individual differences in choice of time-headway are then expected to be related to individual differences in braking skills. Braking for a lead vehicle requires a number of skills varying from perceptual skills needed for a fast detection of decelerations of the lead vehicle to perceptual-motor skills involved in tuning the motor response to visual input. This study was aimed at finding the relevant skills related to choice of time-headway during car-following. In the literature on braking perceptual mechanisms, such as the estima­tion of time-to-collision and the detection of deceleration of a lead vehicle, are emphasized as important skills. Also, the ability to initiate braking as fast as possible is seen as an important factor in rear-end collisions. Starting from the existing literature, it was inves­tigated whether choice of time-headway is related to the ability to initiate braking as fast as possible. Using the logic of the additive factor method the locus of effect for differences in reaction time was examined. The stimulus encoding stage of the information-processing chain was manipulated by switching the brake lights of the lead vehicle on or off. This resembles a manipulation of the factor stimulus degradation. The motor-adjustment stage was manipulated by the presence or absence of a warning signal 1 second in advance of stimulus presenta­tion (deceleration of the lead vehicle). The presentation of a warning signal affects time uncertainty, a factor that is known to affect the motor-adjustment stage. The manipulations both had statistically significant additive effects on reaction time. This confirms the results reported in the experimental psychological literature that different stages are selectively affected by these two manipulations. However, no signifi­cant effect of preferred time-headway was found on reaction time. Also, no significant interactions of preferred time-headway with either the brake lights or the warning signal manipulations were found on reaction time. This indicates that choice of time-headway is not related to reaction time. It also indicates that choice of time-headway is not related to the speed at which a decele­ration is detected or to the speed at which the state of motor-readiness is reached. The results on movement time (MT) revealed a different pattern. The factor warning signal had a significant effect on movement time; presentation of a warning signal resulted in a larger movement time. This result is difficult to explain. Generally, in laboratory experiments no effects of time uncertainty on movement time are found (see f.i. Frowein, 1981). A possible explanation is that the absence of a warning signal resulted in a longer reaction time and thus a higher criticality at the moment the motor response was initiated. This required the subjects to speed up the motor response. However, the absence of a significant effect of the factor brake lights on movement time makes this explanation highly unlikely because the brake lights manipulation had much stronger effects on reaction time. If there are effects of criticality on movement, the manipulation of brake lights is expected to have a greater effect on movement time than the warning signal manipulation. This obviously was not the case. Also, since the subjects were instructed to brake as fast as possi­ble, criticali­ty effects were not expected. There was no significant effect of preferred time-headway on movement time. This means that there is no evidence that short followers differ from drivers with a larger preferred time-headway in the ability to generate a faster motor response per se. However, the interacti­on between preferred time-headway and the brake lights manipulation on movement time was significant. Only when the lead vehicle carried brake lights, short followers moved their foot faster to the brake maximum than drivers with a larger preferred time-headway. The relation between preferred time-headway and movement time was absent when the lead vehicle did not carry brake lights. This is partly consistent with the results reported by Marteniuk et al. (1988) in a study of motor learning. They found that as the perfor­mer is more skilled in the execution of a motor task, changing the feedback conditions strongly interferes with motor execution. The absence of brake lights may be regarded as a strong change in feedback conditions, since the brake lights of the lead vehicle are an important cue for the driver in braking. Post-hoc analysis revealed that the interaction of preferred time-headway with the brake light manipulation on movement time was mainly caused by a trial order effect. In the first braking maneuver there was a strong effect of preferred time-headway on movement time, only if brake lights of the lead vehicle were switched on during braking. This effect was absent in later braking maneuvers. The first braking maneuver differs in one important aspect from later braking trials. During later braking trials the subjects knew the level of deceleration of the lead vehicle and the duration of its deceleration, while this information was not available to the driver during the first braking trial. This suggests that preferred time-headway is related to the skill to transfer visual feedback to a required motor response. During the first trial visual feedback had to be interpreted during the course of braking, while during later trials the required motor response was known even before the response was generated. This means that for later trials a standard learned fast response could be generated while in the first trial the transformation of visual feedback to the motor-response may have played some role. This suggests that the differences in response execution speed as a function of preferred time-headway are restricted to braking situations characterized by uncertainty concerning the braking by the lead vehicle, the required dece­leration and the duration of braking, as is the case in normal car-following situations. Does a better car result in safer driving ?